Lawrence Jiko Barrow - is a ceramic artist living in Kyoto. He is an ordained zen monk, having trained at Bukkoku-ji zen temple in Obama, Fukui-ken under Tangen Harada Roshi for more than a decade. He was given the name Jiko 慈光、which translates as Compassionate Light. 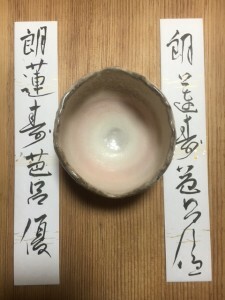 Now living in the Higashiyama hills of Kyoto (near Sanjusangendo temple) where he has a pottery named Jiko-gama 慈光窯。 Lawrence was born in 1970 to English and Japanese parents in Thailand, grew up in Tokyo and Hong Kong and educated in the U.K. and the U.S. He is a graduate of the Traditional Arts College, Kyoto and is currently apprenticed to Shigaraki potter, Sawa Kiyotsugu. He makes ceramic works that are functional: teaware and tableware and also non-functional 'objet' sculpture, he fires in both electric and wood-fired kilns. 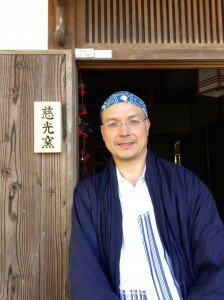 He studies kintsugi (golden joinery) and chado at the Urasenke International Chado Institute. Having grown up both in the east and the west he has a love for the traditional arts of Japan. He is also a haiku poet.